Federal Building apartments are ready. Weston’s old post office, also once known as the Federal Building has had its upper floor renovated by developer Jack Morelli of First Avenue Properties and is now seeking tenants. Readers may remember that across the street, Mr. Morelli is building low-rise condominiums on the old beer store site so these renovations might be some clue as to how he views the neighbourhood’s potential. Readers may also remember that the ground floor of the building will be a medical centre opening next year. WestonWeb took a ‘stickybeak‘ on Tuesday morning during an open house. Arriving a leisurely half-hour after the event had begun, WestonWeb’s south media team (Roy and Roy) found the front access doors to the apartments were still locked. Since a previous visit in July, even more windows at ground level have been broken. Not an auspicious start. Unable to cool off in a tantalizingly unopened fabulous new coffee shop, a quick scout around the back of the building revealed a door left ajar. A set of terrazzo stairs that have seen better days led to the top floor where a pair of startled agents sprang to their feet and introduced themselves. First Avenue has gutted the top floor and installed 15 apartments in place of the old offices. There is a choice of one, two or three bedrooms averaging 800 square feet. 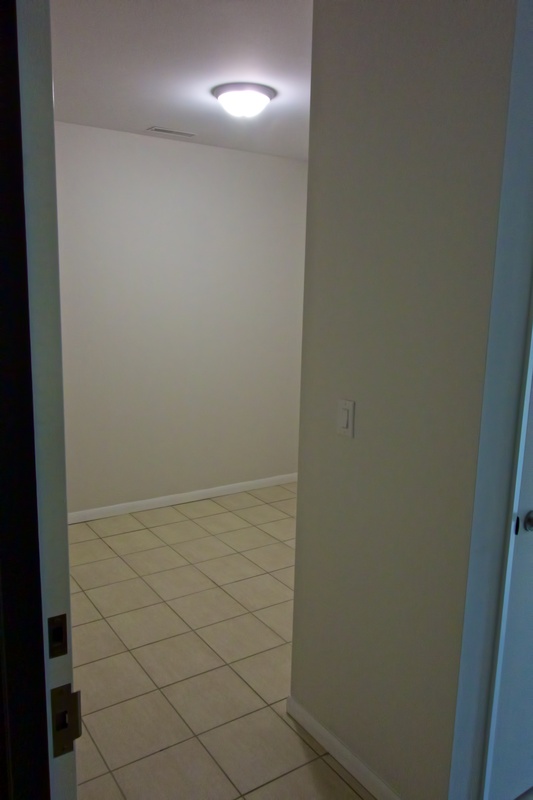 All apartments and hallways have the same tiled flooring throughout and flat (not textured) 9-foot ceilings. A variety of layouts is available but unfortunately, First Avenue’s definition of a bedroom is sometimes an enclosed space with a door but no window. In one apartment, one of the alleged bedrooms was simply a windowless alcove – a feature described by the agent as flexible. When asked if a windowless bedroom was legal in Toronto, the agent went quiet. When pressed, another awkward silence ensued. 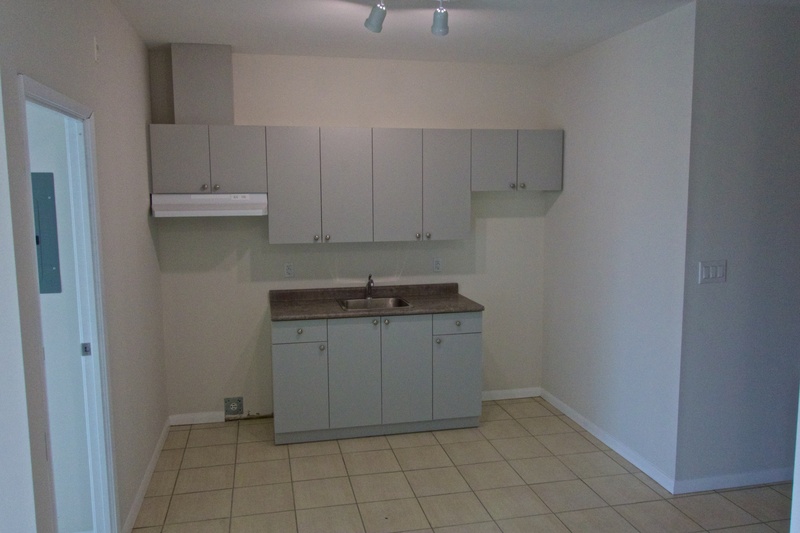 Kitchens are small with formica countertops. The appliances had not yet arrived yet but range hoods appear to be vented to the outside. Bathrooms are standard toilet sink and bath/shower combinations. The kitchen alcove in Apartment 203. Prices for the apartments range from $900 for a one-bedroom $1050 for a two and $1200 for a three-bedroom. Water is included but heat and hydro are billed extra; heat being supplied via individual apartment furnaces through ceiling vents. Although no laundry facilities are provided in the apartments, a coin laundry room will be available. The lack of air-conditioning could be a problem in summer as windows are quite small. Each unit comes with one parking space. A windowless bedroom in Apt 203. 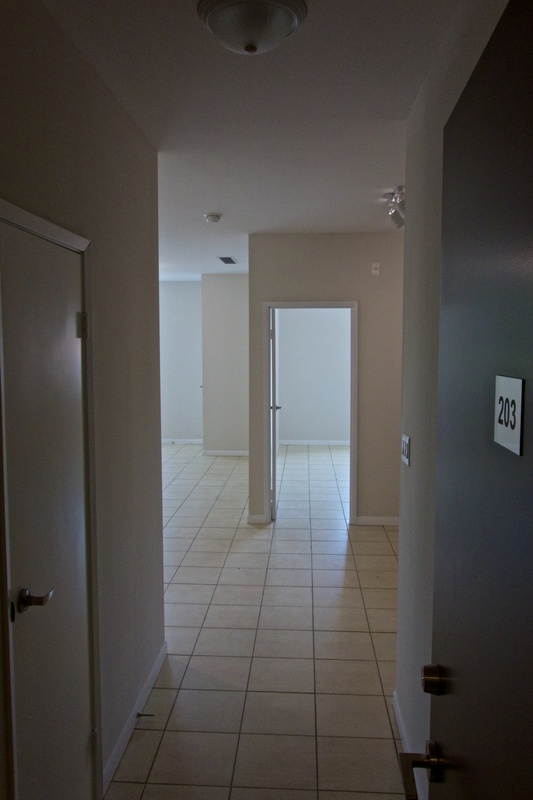 The living room (L) and a bedroom of Apt 203. While no-one will accuse First Avenue Properties of gentrifying Weston, it’s nice to see any reasonable development coming to a formerly empty space in a significant Weston building. Residents will occupy brand new walk-up apartments and have access to a variety of amenities within easy walking distance at an affordable price. The developer might however want to do something about the state of the ground floor exterior which continues to deteriorate. Author Roy MurrayPosted on August 28, 2014 August 28, 2014 Categories Business, Opinion, Real estateTags Apartments for rent, First Avenue Properties, Toronto, Weston Federal Building5 Comments on Federal Building apartments are ready. 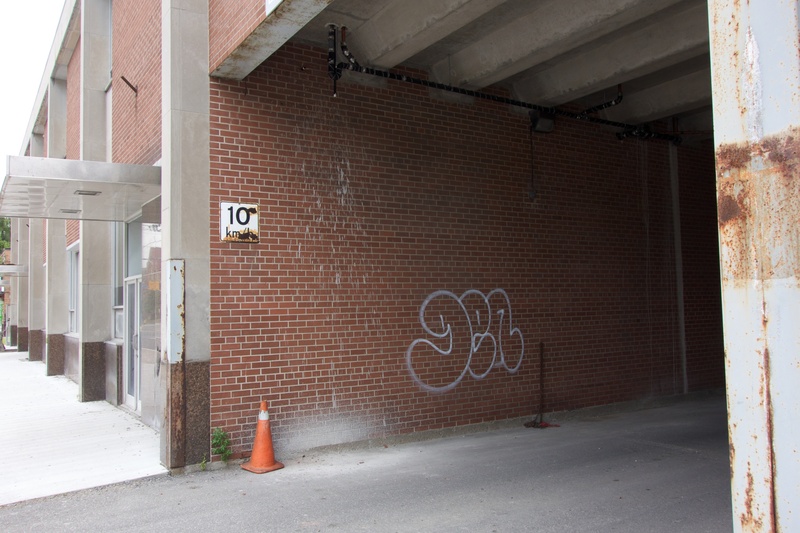 Last August WestonWeb commented on the dismal state of buildings along Weston Road. 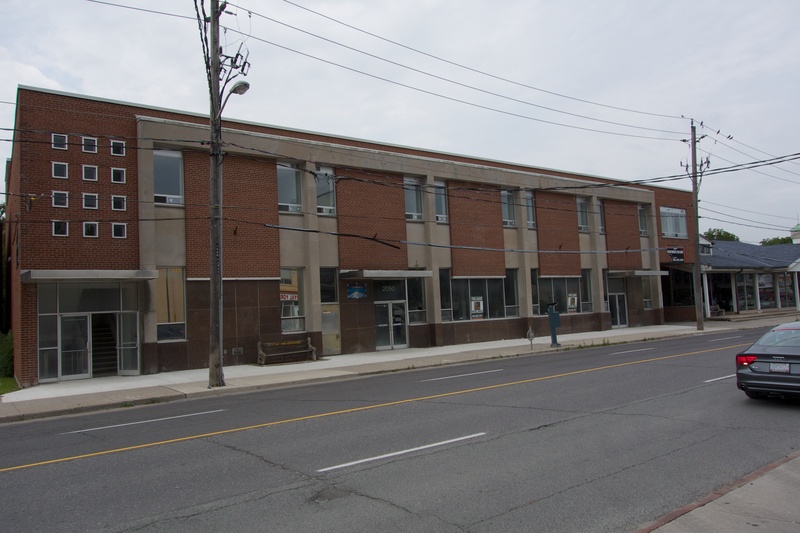 This is the first in a series of updates starting with 2050 Weston Road – what was once known as the Weston Federal Building, containing the post office for many years. 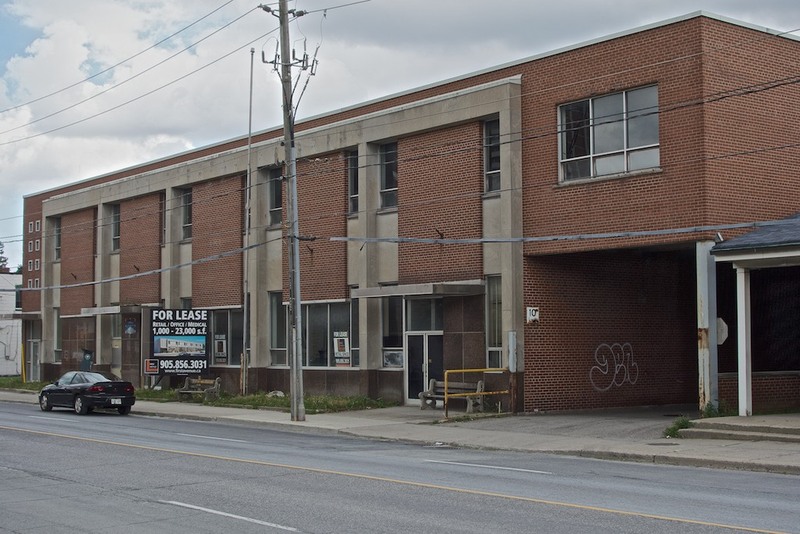 In 2012 the Federal Government sold the building after efforts by Mike Sullivan and Frances Nunziata to make the property available for community use. The premises have stood vacant for years but now, while things are happening inside, external appearances have changed little. The old Federal Building as it looked last August. The Federal Building as it looks today – little changed, its facade still blighted by ugly utility wiring. A reader of the original article commented that changes to the building had been held up because of asbestos issues on the second floor. These seem to have been fixed as the interior is currently being worked on. 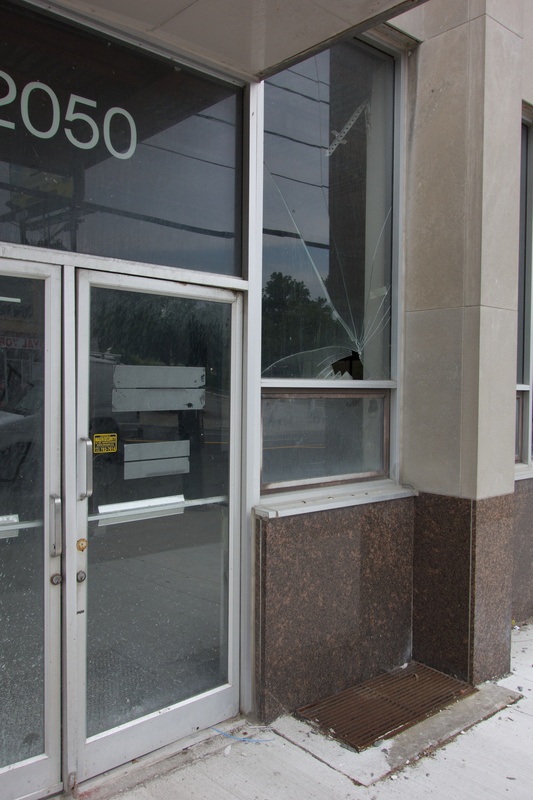 While there has been quite a bit of activity inside the building, the once attractive brick, cement and granite exterior remains largely as it was with a broken window and old graffiti allowed to remain. The planting beds outside the building have been cemented over. The upper floors are being converted into apartments and are advertised for rent. 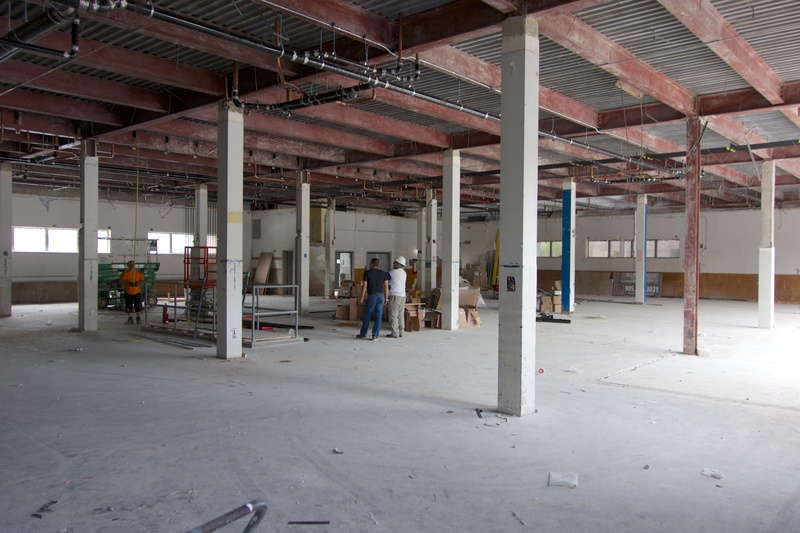 The interior has been stripped and work is in progress on the ground floor. A broken window outside the old entrance. Graffiti is still there after more than a year. 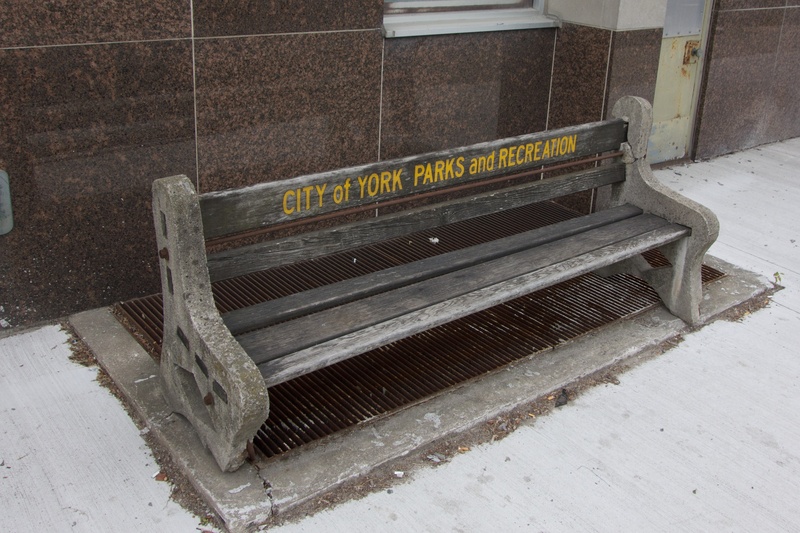 This bench is an artifact from the old City of York and belongs in a museum. While First Avenue Properties has had a ‘For Lease’ sign displayed on the premises since last August, several calls to arrange a viewing were put off with the comment that, ‘The agent who deals with the property is not in the office’. 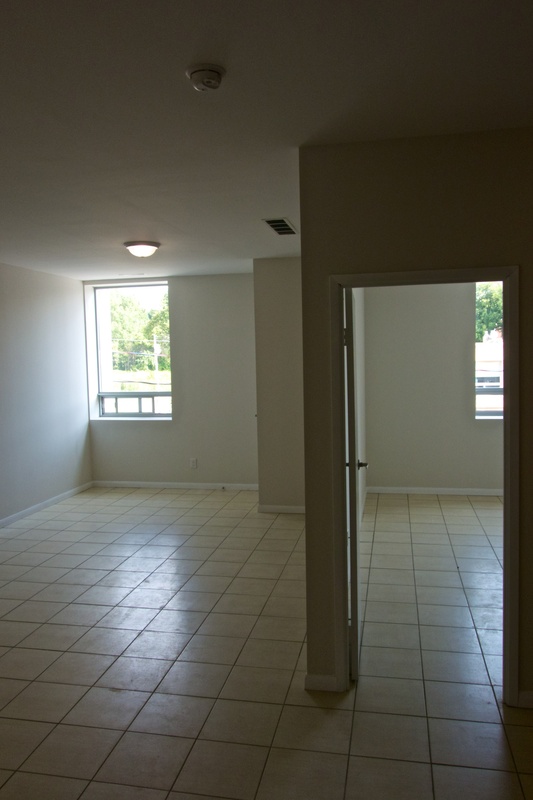 They did allow that the upper floor apartments will be bachelors and one-bedrooms. If readers wish to try for themselves, the phone number is 905-856-3031. Author Roy MurrayPosted on July 22, 2014 Categories Real estateTags 2050 Weston Road, Weston Federal Building3 Comments on Weston Federal Building Update.